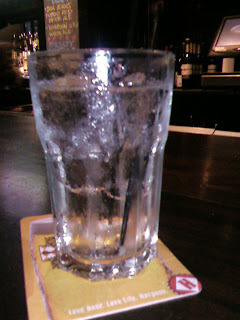 As many of my friends and I agree, there is nothing wrong with a good cocktail once in a while. And when that cocktail embraces one of the very essences of this great city of Boston...well that just takes the cake. Today, Absolut Vodka will be unveiling their newest, limited edition, flavored vodka- Absolut Boston. In a bottle paying homage to the Green Monster of Fenway Park, flavored with Black Tea and Elderflower, in honor of the Revolutionary nature of this great state, Absolut Boston is designed to capture the spirit (and the fun) of Boston. 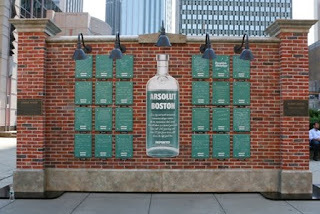 As part of the great celebration, Absolut is unveiling the Boston Wall of Pride today. Located in Boylston Plaza, this "wall" will showcase some famous Bostonians favorite city moments. According to the Absolut press release, celebrities include Amy Poehler, Jim Rice, Mayor Menino, Carlton Fisk, The Dropkick Murphy's, Eddie Doyle, Ben Mezrich, John Lithgow, Cam Neely among others. For the next ten days (til September 4, 2009) this wall will be on display, and if you're interested you can even bid on pieces of the wall to keep forever. I haven't gotten a chance to check it out yet myself- but I bet there are some great pieces there- Amy Poehler is one funny chick in my opinion. Another great "Boston Moment"? Absolut is donating $50,000.00, as well as all the proceeds from the auction to The Charles River Conservancy- you know- to keep that Dirty Water clean! Unfortunately, I have to miss the official unveiling of the wall today (11:00 AM Boylston Plaza), but the fabulous PR lady has offered to send me photos of the event-so Ill post them here for you to check out.--Photos posted courtesy of Ketchum. Definitely head over to the actual "wall" though! Its not every day that Boston gets a tribute vodka! try it with equal parts of st. germain. it really brings out the elderflower flavor!